NASA Armstrong’s F/A-18 aircraft will fly during the agency’s QSF-18 flight campaign over Galveston, Texas. 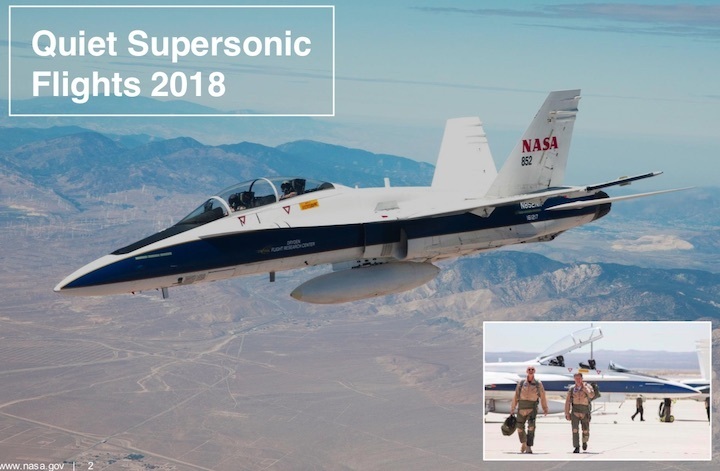 NASA has updated the date for the media day event at which journalists are invited to learn about the agency’s Quiet Supersonic Flights 2018 campaign. The event will now take place Tuesday, Nov. 13, in the Houston area. Test pilots and project leads will be available for interviews and to share information about the flight series, known as QSF18, and its contributions to NASA aeronautics research. 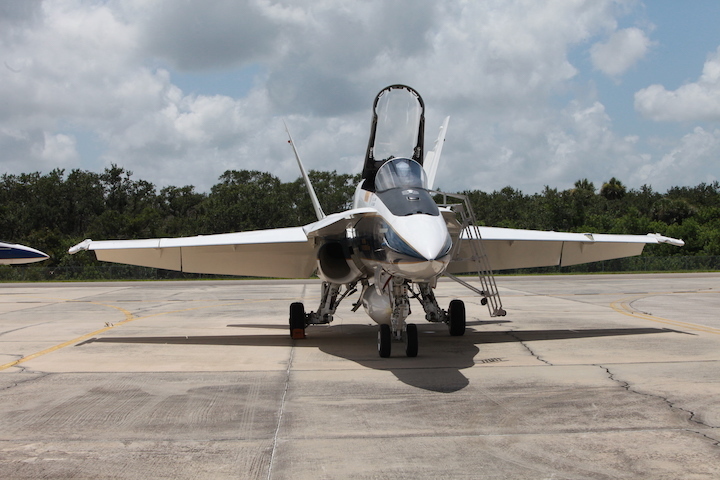 Media also will get a close-up look at flight operations with NASA’s F/A-18 research aircraft as they are used to test community response over Galveston, Texas, using a “quiet thump” technique designed to reduce loud sonic booms typically associated with supersonic flight. The event is weather-dependent, but is currently scheduled to begin at 10 a.m. CST at Ellington Field, just north of NASA’s Johnson Space Center in Houston, then moves to Galveston, where QSF18 field team members operating microphone stations will measure sound levels. Reporters will have an opportunity to observe the field equipment and interview personnel during periods between quiet thumps. Media planning to attend must contact the Johnson newsroom at 281-483-5111 before noon Friday, Nov. 9. The event is weather dependent. Should inclement weather occur, please contact the Johnson newsroom for more information. The QSF18 campaign is a cooperative effort involving NASA’s Armstrong Flight Research Center in Edwards, California, Johnson, and NASA’s Langley Research Center in Hampton, Virginia. Do you live in the Galveston, Texas area? Galveston City? Hitchcock? Texas City? Goat Island? For two weeks starting November 5, 2018, we flew a NASA research aircraft at supersonic speed over the Galveston area during the mornings and/or afternoons. Usually an aircraft flying that fast makes a very loud sonic “boom!” sound. But for these tests, we flew a unique pattern that created a much quieter sound over the land. The area where people might hear the quiet “thump” sound was bigger than the official response survey area, so we conducted this citizen science activity to also collect responses from people not participating in the official survey or who lived in the official "Community Response Survey Area." Then use the Citizen Science form on this page to record your responses (e.g., time, location, perception of sound). You are not required to enter any personal information. See posts associated with QSF18 @NASAAero on Twitter and Facebook, and @CityofGalveston on Twitter /cityofgalveston on Facebook. 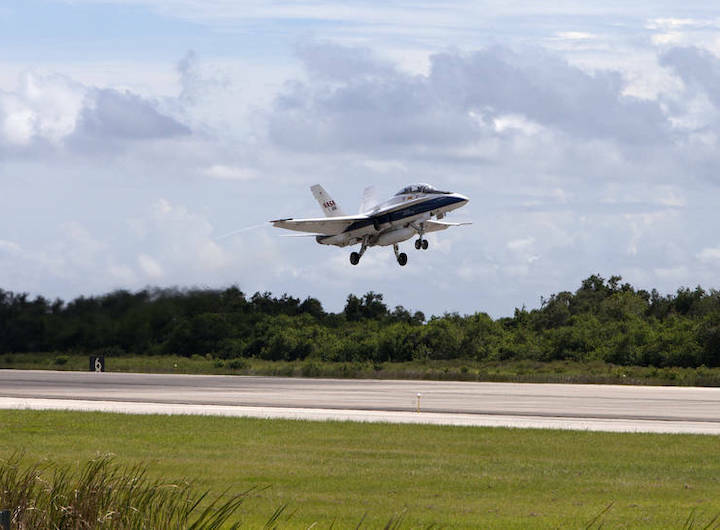 NASA will fly its supersonic F/A-18 jet over the Gulf of Mexico while researchers measure public response to the aircraft’s noise in and around the coastal city of Galveston, Texas. 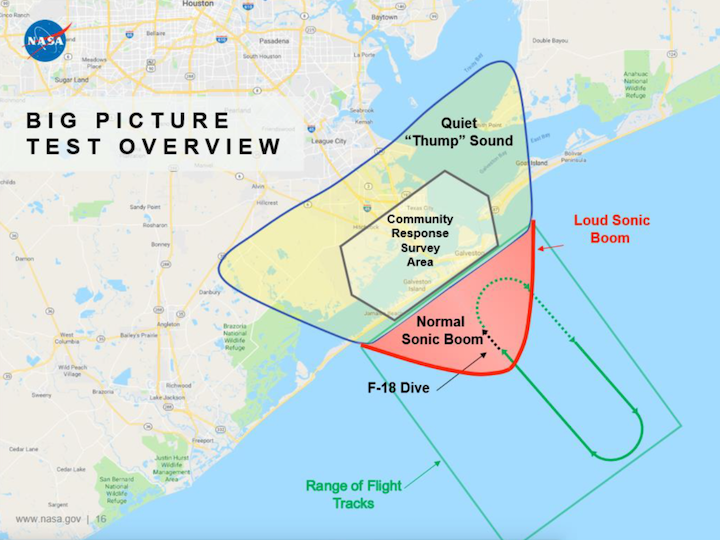 The F/A-18 pilot will fly a unique diving maneuver over the Gulf of Mexico that will result in the possibility of Galveston area residents hearing a quiet sonic “thump” instead of the loud and sometimes disruptive sonic booms historically associated with supersonic flight. NASA is recruiting via mail some 500 residents to participate in the two-week-long research activity. Participants will be asked to fill out a brief online survey several times each day about their impressions of any noise they hear from the F/A-18 jet. Residents who participate for the full duration will be paid $50. The city of Galveston was selected because its coastal location enables the F/A-18 to fly a supersonic maneuver that sends a quieter sonic “thump” toward Galveston and confines louder sonic booms to the open water of the Gulf of Mexico. NASA’s nearby facilities at Ellington Field also will enable more efficient aircraft operations. NASA researchers will place sound-measuring equipment in and around Galveston to supplement the public response data. Locations will be selected based on research needs and approval from local authorities. To ensure public safety and awareness, NASA is cooperating with local, state and federal authorities and conducting an extensive public outreach initiative in support of this research. Results from this activity in Galveston will inform research methods for future community response surveys that will use NASA’s X-59 Quiet Supersonic Technology aircraft. 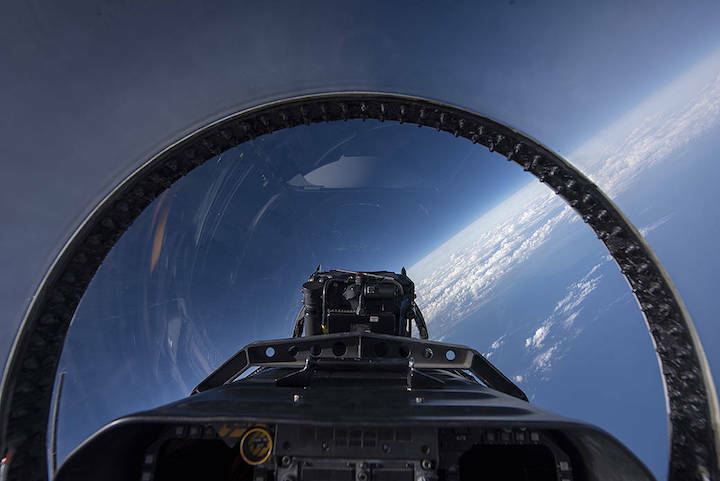 NASA’s Low-Boom Flight Demonstration, which includes QSF18, is a comprehensive, scientifically-driven effort to provide U.S. and international regulators with statistically valid data that could result in new rules that allow commercial supersonic flight over land. Starting on November 5, NASA will begin flying F/A-18 research aircraft, one of them pictured here, to perform a special dive maneuver that will create a sonic boom out over the Gulf of Mexico in such a way that residents in Galveston would perceive it as a quiet thump – that is, if they are able to hear them at all. NASA is set to begin a series of quiet supersonic research flights off the coast of Texas near Galveston to test ways to measure the community’s response to a unique acoustic experience. Normally, an aircraft flying at supersonic speeds (faster than Mach 1, the speed of sound) produces a sonic boom so loud that, today, commercial supersonic flight is prohibited over land. 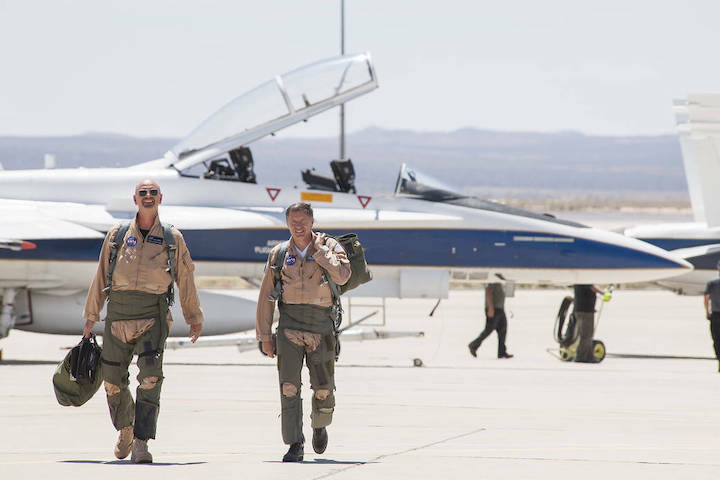 Beginning Nov. 5, however, NASA test pilots will fly an F/A-18 supersonic research aircraft in a unique maneuver that creates a quieter “thump.” Capturing how people and sensors on the ground respond to that sound is the goal for the Quiet Supersonic Flights 2018, or QSF18, campaign. The F/A-18 is a typical supersonic aircraft so, in order to shush the boom, it will be put into a quiet supersonic dive maneuver. Starting out over the water at around 50,000 feet the aircraft will be put into a special dive that still creates a regular sonic boom, however when the sound reaches land it should be heard as a quieter “thump” instead. QSF18 is unique for another reason. For the first time, NASA’s Johnson Space Center, located just north of Galveston, will provide critical support for a NASA activity is about flight but not into space! The center’s flight operations staff are part of the team supporting the QSF18 aircraft, pilots and other crew based out of nearby Ellington Field. 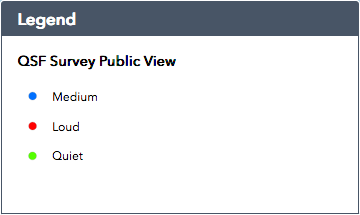 In Galveston, community feedback data will be gathered through the use of a survey, in which 500 recruited volunteer residents, if they hear the thumps, will define the level at which they were able to perceive the sound. QSF18 data will be used to help NASA better understand successful data collection methods for future flights using an experimental aircraft called the X-59 Quiet Supersonic Technology, or QueSST, demonstrator. Starting in 2022, the X-59 will directly fly over yet-to-be-selected communities to collect data using lessons learned from QSF18. While the “quiet thumps” produced by the F/A-18 present no risk of causing physical damage to people or structures, NASA has learned that elements such as atmospheric turbulence and humidity can influence how certain areas may perceive the sound, which may be heard differently from other areas. NASA will operate a number of microphone stations in the area to match up the community’s response with the decibel level of each sonic thump. The research aspect of the flight series also consists of several contractor efforts, including Volpe National Transportation Systems Center, Gulfstream Aerospace Corporation, Applied Physical Sciences, Eagle Aerospace, Penn State Survey Research Center, and KBR Wyle. 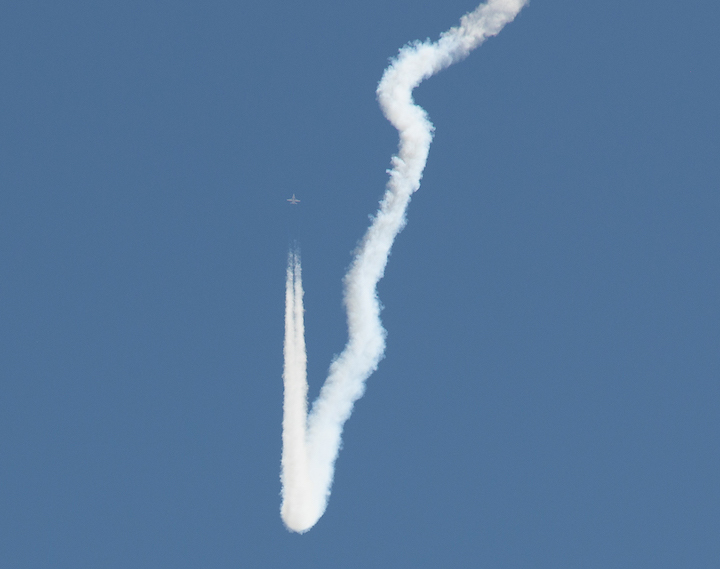 A NASA F/A-18 demonstrates the quiet supersonic dive maneuver over NASA’s Armstrong Flight Research Center in California, creating a quiet thump in a necessary area instead of a louder sonic boom. NASA has used microphones to measure the levels of these sounds, and has studied the thumps to confirm they pose no danger to people, animals or structures.